You know her as Crazy Eyes on Orange Is the New Black, but just like we were shocked to find out that she has very white, normal parents on the show, our minds were blown by how feminine and stylish she is in real life. 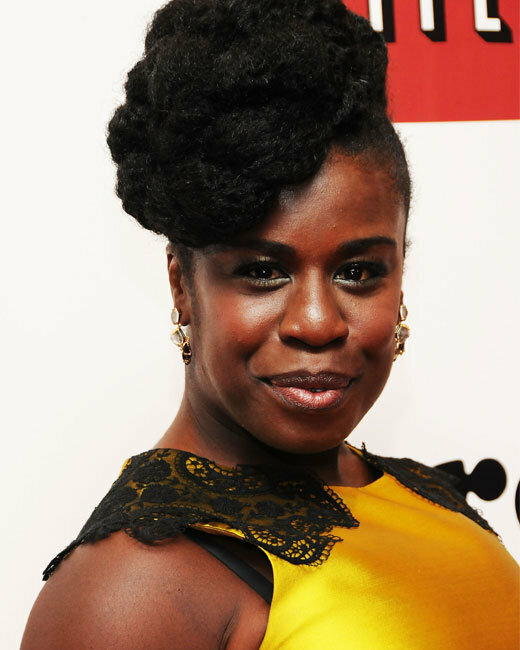 Here is actress Uzo Aduba workin’ that yellow dress, and her hair and makeup are equally stunning. She’s almost unrecognizeable from the show, where she wears that drab, tan prison uniform with her hair in multiple mini twists. Suzanne “Crazy Eyes” Warren is one of our favorite characters because she is a complex juxtaposition of sensitive, poetic romantic (she loves quoting Shakespeare) and intense, unpredictable madwoman (she pees in Piper’s bunk when Piper rejects her). In short, Crazy Eyes is as original as they come.